The dollar was down against most of its peers on Wednesday, pressured by a cocktail of negative factors including heightened concerns over a partial U.S. government shutdown and tension between the White House and the Federal Reserve. Fears of a U.S. and global economic slowdown have sent U.S. 10-year yields tumbling by around 25 basis points in December, adding to the increasing strain on the dollar and further darkening its outlook. "Moderating U.S. growth and political tensions are negative for the dollar and we expect continued weakness," said Sim Moh Siong, currency strategist at Bank of Singapore. "I expect the biggest winner of global risk-aversion to be the yen." The dollar has struggled particularly against the yen, losing ground for eight straight sessions as a broad risk-off move in financial markets benefited the safe-haven Japanese currency. It tried to steady in early Asian trade on Wednesday, edging up 0.1 percent on the yen to 110.43. Analysts at Mizuho Bank said the sharp decline in U.S. 10-year treasury yields has dented the dollar's performance versus its peers. U.S. 10 year paper is currently yielding 2.73 percent, having fallen from 3 percent in early December. The euro and the British pound tacked on 0.2 percent each, changing hands at $1.1415 and $1.2705, respectively. The Australian dollar added 0.1 percent to fetch $0.7043. 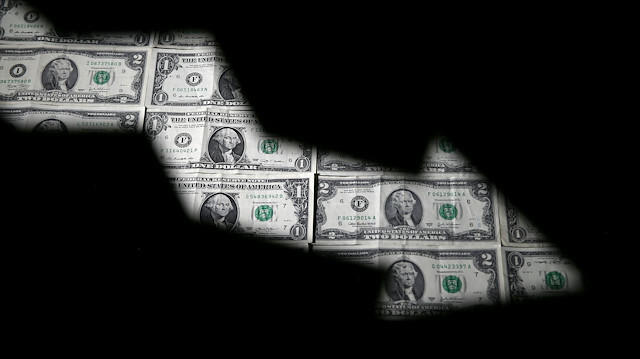 Over recent months the dollar has struggled to shake off a growing list of bearish factors, led most recently by speculation over the outlook for U.S. interest rates, falling bond yields and the plunge in oil prices. Last week, the Federal Reserve raised rates for the fourth time this year, and largely kept to its plans to hike rates next year despite heightened economic risks. That prompted U.S. President Donald Trump to step up his criticism of Fed Chairman Jerome Powell, with the public tussle between the White House and the Fed rattling investors. Trump blasted the Fed on Monday, describing it as the "only problem" for the U.S. economy. The partial U.S. government shutdown has also added to investor worries about the growth outlook. The U.S. Senate has been unable to break an impasse over Trump's demand for more funds for a wall on the border with Mexico, and a senior official said the shutdown could continue until Jan. 3. Elsewhere, commodity currencies such as the Canadian dollar traded at C$1.3609 in Asian trade, close to its lowest level in more than a year. The New Zealand dollar was at $0.6729, up 0.06 percent on the dollar.